I used to feel I needed to keep my distance from the world. I thought that my life would be easier, that everything would go more smoothly. This way, I thought, I could live more fully in the Self. I thought this was enlightenment. However, our 2018 Year-Long Programme, Enlightenment in the Midst of Life, showed me otherwise. Sadguru Swami Nirmalananda’s took us through powerful monthly teachings. She showed us that withdrawing from the world won’t free us from petty thoughts and desires. Nor will withdrawing make life smoother or easier. Articles, audio discourses, conference calls and the final in-person retreat opened me to a different understanding. Enlightenment will not change the events and conditions of my life. When I am enlightened, I will be a different person experiencing them. Through Swamiji’s teachings about enlightenment, I have deeper access to my own Self — the One Self Being All. Swamiji’s teachings reach into my own life in the world. As a Self-Realized Master, she knows firsthand the journey as well as the landscape of enlightenment. This past year her teachings propelled me to deeper practice. She explained that if you’re not working on being enlightened, life will push you toward it anyway. However, when you’re working consciously, you can manage your process. Attaining enlightenment is not about leaving the world. It’s about being in the world and doing the same things you would be doing. Yet your actions are coming from a different perspective. You make different decisions and the effects are different. Enlightenment will not make your life easier; it won’t change what happens to you. Your life is different because who you are is different. There were so many eye-openers over this past year. Swamiji’s teachings showed me where I’ve been and where I am. They showed me the promise of where I am going. 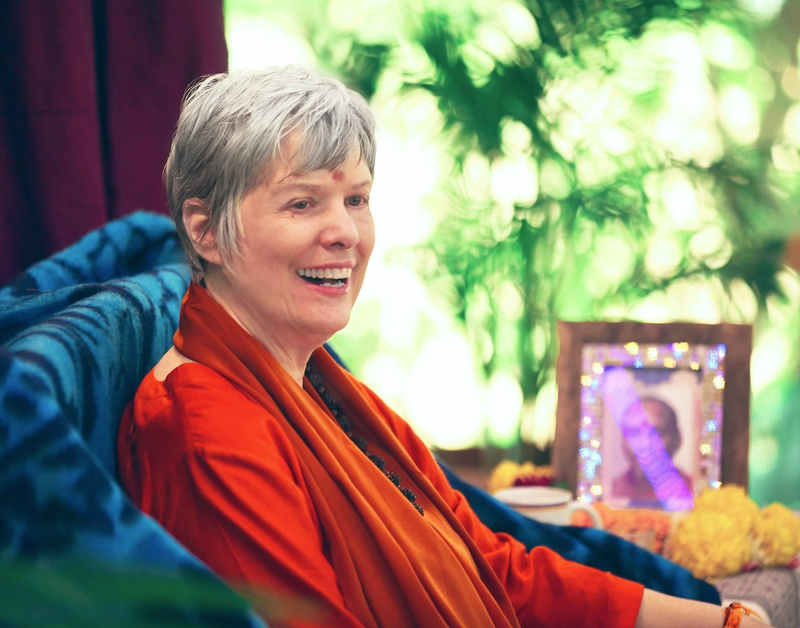 Swamiji assured us, “Every situation in our lives is designed to push us into transformation.” When a situation is difficult, will I retreat and feel sorry for myself? Or will I accept the difficulty, step forward and learn the lesson? I’ve come to see that the things we grumble about just push us forward. Every situation, especially the ones that we resist and complain about, is designed to push our buttons. Then I know, “Oh, I have more growth to do, and this situation is showing me what it is.” With this understanding, I am less resistant to what happens in my life. I am more present. Swamiji emphasizes mantra and seva as most important for enlightenment in the midst of life. Now mantra repetition often starts up in the background of my mind spontaneously. It’s very comforting, very quieting, continuing underneath everything. It reminds me that Kundalini is running things. She realigns my body. She wakes me up at 3 am to meditate. She tells me when I need to stop my activity. She says, “You have to do Ujjayi now or you won’t be good for anything.” And I love seva. I find that whenever I am involved in seva it aligns me with Self. In 2010, I took The Shiva Course, Swamiji’s first Year-Long Programme. I have enrolled in every one since. The conference calls as well as the in-person retreats have been very important. These deep experiences have propelled me forward faster than any other experience. Swamiji begins the group’s closing retreat at a much deeper level than any other retreat. She says she can do this because of our shared learning throughout the year. Sharing my experiences with others shows me when and how I am holding myself back. At this last retreat, I noticed I was reluctant to give up an old anger. I saw clearly that I was unwilling to release this pain. Then I knew it was ridiculous. The resulting re-direction to Self was delicious. Ultimately, I learned that I am happier and more effective when I let Self take charge. I tell my mind what I have heard before from Swamiji. She quotes Baba Muktananda: “Be a servant to the Self; don’t try to be the boss.” I am looking forward to February 24. That’s the date for the Free Intro Phone Call for the 2019 Year-Long Programme. Give yourself a treat, and register for this call, too. This entry was posted in Ashram News on February 5, 2019 by Svaroopa Vidya Ashram.